Kate Wiles explores a unique nautical chart, designed to be understood only by its creator. The Marshall Islands, spread across 29 coral atolls and five islands in the Pacific Ocean, have, inevitably, encouraged a highly sophisticated understanding of navigation and seafaring in their inhabitants, which has been aided by innovative and successful technologies. Stick charts show a complex and deep understanding of their makers’ environment, in particular of how water reacts to land. They were intended to be used before a voyage, so sailors could learn and understand the patterns of the sea, rather than for navigation once they had set sail. Each map is unique and was used and understood only by its maker. 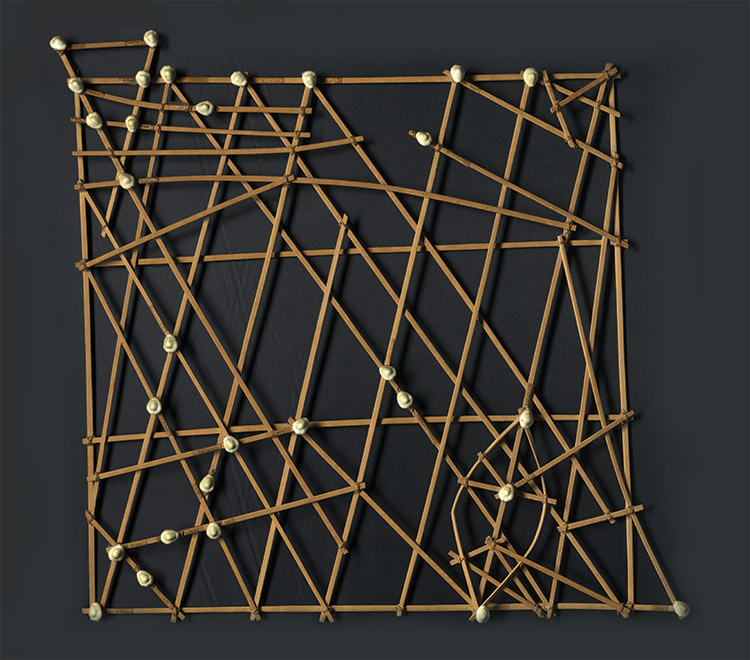 On this map, islands and atolls are represented with seashells; the straight sticks (made of coconut fibre) show currents and waves around them; and the curved sticks represent ocean swells. Stick charts were first introduced to western audiences in the 19th century and satellite technology has recently validated the accuracy of the Marshall Islanders’ understanding of the sea. Efforts are currently being made to revive traditional navigation techniques in the Marshall Islands.